POWER will return for a third season, Starz announced. The ten-episode season 3 will go into production this September. Are you excited for more POWER? 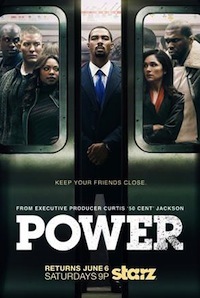 POWER is back this Saturday with its new season. And with its expanded second season — ten episodes, up from season 1’s eight hours — comes new characters, evolving relationships, secrets being revealed, and much more. And, of course, Ghost is trying to navigate his desire to be an honest business man with his ties/connection to the less…ethical…business world he also resides in. STARZ has picked up POWER — the story of James “Ghost” St. Patrick, a New York City nightclub owner who deals with the city’s elite — for a second season, the network announced. So far, only one episode (out of an eight-episode order) of POWER has aired. Production of the 10-episode second season will begin in September.